Today for maths we used our fingers to add to 10. We did 5 dots + 5 dots = 10 dots , 6 dots + 4 dots = 10 dots and 2 dots + 8 dots =10 dots. 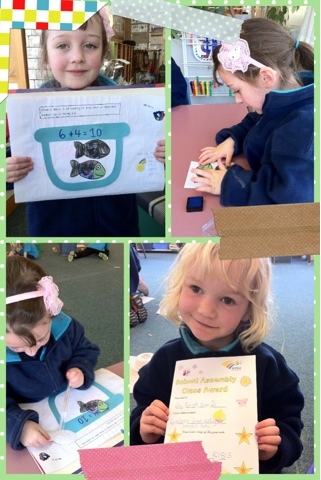 Look at the cool fish in the fish tank we made to show adding to ten. Ruby also received a certificate for excellent progress in reading.